Do you have to shoot in Manual mode to be a professional photographer? Many beginning photographers are somehow put under the impression that professional photographers shoot in Manual mode exclusively and that using Manual mode correlates to being an experienced photographer. But is it true that all professional photographers use M mode? In short, no. You don't have to shoot in M mode to be a pro. However, you're not going to impress anyone by shooting in Auto mode either. There are reasons that pros often shoot in Manual mode. From what I've heard from other photographers and read from polls on forums, there is a pretty even balance between people shooting in Manual mode and Aperture Priority mode (A for Nikonians, Av for Canonites). Either they shoot exclusively in one of these or switch between them depending on the situation. Though experimenting is always the best way to find out what works well with you, here's a guide to show you when each mode is most commonly used. If you couldn't have guessed, everything in M mode is set manually (except for focus). This includes the ISO, white balance, aperture, and shutter speed. M mode is the only mode that doesn't have some kind of automation to it. Many photographer's like having complete control over the aperture and shutter speed, and those with a lot of experience using this mode can usually guess how to meter a scene just by looking at it. Using M mode is great for beginner's too because it gives the photographer a better understanding of both aperture and shutter speed. But not all pros use this mode. Some lighting situations are tricky or can change quickly, and this makes it difficult to keep up with changing the settings. Manual mode is best used for situations where the lighting is constant, like a studio or a sunny day with no clouds. Once you nail the right exposure, you can set the aperture/shutter speed combo in M mode and your shots will remain at a consistent exposure. This mode is another popular choice for photographers because is allows you to choose the aperture (which is a priority for many photographers) and have the camera automatically pick the shutter speed to give you a correct exposure. You may be wondering why everyone doesn't just use A mode and let the camera do all the work instead of wasting time changing settings manually. Well, every camera's metering system is a little different which means that they may differ in choosing a correct exposure. While any decent camera will have an exposure that is close to perfect, some may be a little overexposed or underexposed for the photographer's taste. This is especially true in tricky lighting conditions like backlit subjects. Having said that, A mode is often the top choice of photographers shooting in tricky lighting. If the camera doesn't capture the preferred exposure the first time, it will at least give them a ballpark exposure that they can use. So the photographer may then switch to manual to tweak the settings, or simply use the exposure compensation button in A mode which allows you to slightly increase to decrease the exposure that the camera has chosen for the scene. This mode is not very commonly used because most photographer want control over the aperture and depth of field. On occasion, S mode may be useful in situations where you are shooting fast-paced action or subjects in low light. Say, for instance, you're shooting your kid's karate demonstration and notice that you keep getting action blur at shutter speeds below 1/200th. You could set your shutter speed at 1/250th or 1/320th in S mode and make sure your subject is “frozen” every time. However, in these cases, most photographers would still use A or M mode and shoot wide open (aperture all the way open to let in the most light) and adjust the ISO to keep the shutter speed high enough. If you're shooting in Auto mode with a DSLR, stop. 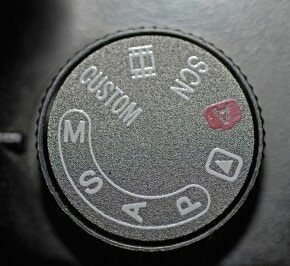 If you want to learn photography, which I assume you do since you bought a DSLR, then Auto mode will teach you very little, and you might as well be using a point-and-shoot. The same goes for scene modes. There are some that joke that P mode stands for Professional mode, but this mode is only slightly more used than Auto mode. There are a few who shoot in P mode, but it's very close to Auto mode in that it selects the aperture and shutter speed for you. It does give you a little more control by giving you the ability to set the white balance and exposure compensation. It also opts for long shutter speeds and higher ISOs rather than using the pop-up flash. But, again, if you're using this mode, I would suggest switching to A or M.
With all that said, it's really all about knowing your camera. As long as you can consistently capture good quality shots that reflect your style, then what does it matter how you capture your image? Aperture and Manual modes are preferred because they give photographers the most control over their camera.